Mother of two, Flordeliza Lansangan of Malate, Manila received the greatest surprise of her life when the Great Taste White team showed up at her doorstep, last Aug 18, 2015 to inform her that she had won P200,000 in the first regional draw of the Great Taste White: Choose Great, Win Great Raffle Promo. The forty-seven year old government employee was speechless at first. When her cash winnings finally dawned on her, the first two things she thought of were her daughter’s education and her mother’s medication. The housewife also hinted at investing a portion of her prize on a small business venture that can also benefit the rest of her family. “I want to help my relatives because this is a blessing that should be shared,” Flordeliza explained in Filipino.These wonderful intentions reflect the great values that Filipinos exemplify. According to Flordeliza, these values are innate in Filipinos, even during the hardest of times. Flordeliza is just one of the five Great Taste White coffee lovers who won P200,000 in the first regional draw held simultaneously in the Greater Manila Area, North Luzon, South Luzon, Visayas and Mindanao. For each regional draw, Great Taste White gives away 14 prizes to 14 lucky winners! Six winners of a white iPad Mini. The Great Taste White: Choose Great, Win Great Raffle promo is on-going and will run until September 18, 2015. Coffee lovers can still win in the succeeding regional raffle draws and in the National Grand Draw, where eight brand new white Toyota Vios 1.3 E M/T cars will be given away and one lucky winner will take home P3 million in cash. Apart from the cash prize, the grand draw winner will also get an exclusive Pinoy Big Brother Experience which includes VIP tickets to the PBB: 737 Big Night, a tour of the PBB House, and a meet and greet with PBB All-In Big Winner, Daniel Matsunaga. 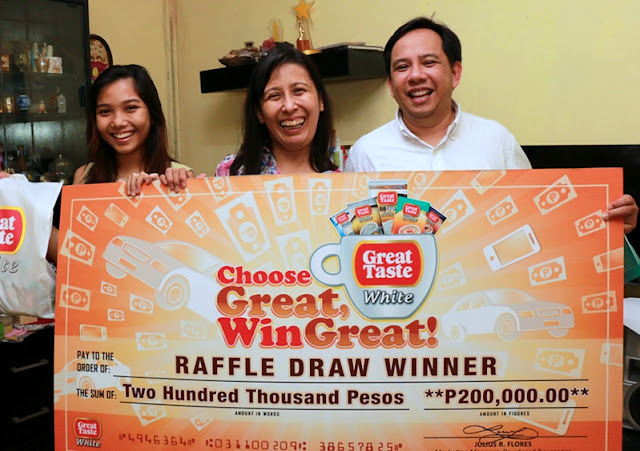 Just like Flordeliza and the other regional winners of the Great Taste White: Choose Great, Win Great Raffle Promo, you too can choose great and get a chance to win great prizes. ©2015 Endemol International. Big Brother is a trademark of Endemol Nederland B.V., registered in the Philippines and other countries, and is being used under license. The winners are so lucky! Good thing she would spend her money on reasonable things. And I love it when she would share it with her relatives. She's really deserving. Gusto ko din tuloy sumali. :) The other prizes are awesome too. iPad mini lang okay na.